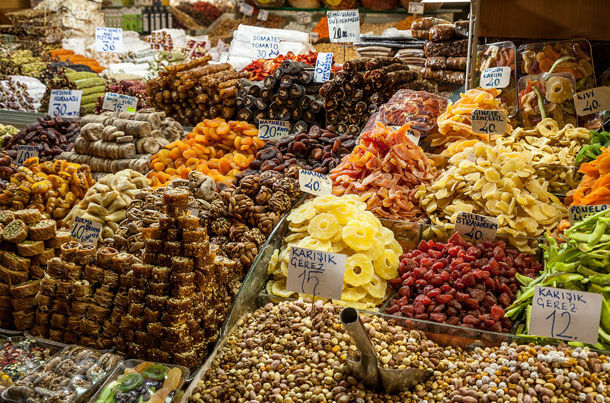 Discover the best hidden tastes of Istanbul. 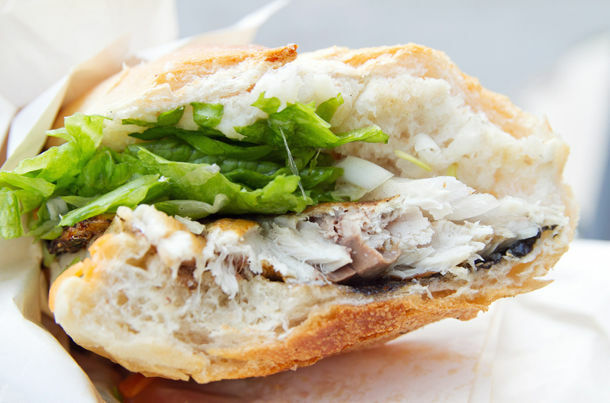 These local advices will take you to a mouth-watering expedition. Are you one of those people who think that you're born only to eat? Can you swear that food is more like the ecstasy rather than being nutritional sources for you? The happiest moments of your life you remember are the ones while you were eating? If your answer is “YES!” for all of these questions, you are the one that I am looking for. Come and join me in this mouth-watering expedition in Istanbul. In Turkey, ocakbasi is kind of an eating tradition that the meat is grilled in front you and served directly to your plates. In this kind of restaurant you are sure that you eat the most delicious meat. Located in Fatih, Kadinlar Pazari, Sur Ocakbasi offers a wide variety from Southeastern Anatolian cuisine. I highly recommend the steak tartar a la turca, or cig kofte in Turkish. Ciger means liver in Turkish and canim cigerim is a phrase used when you want to express your affectionate feelings for someone that you love deeply. 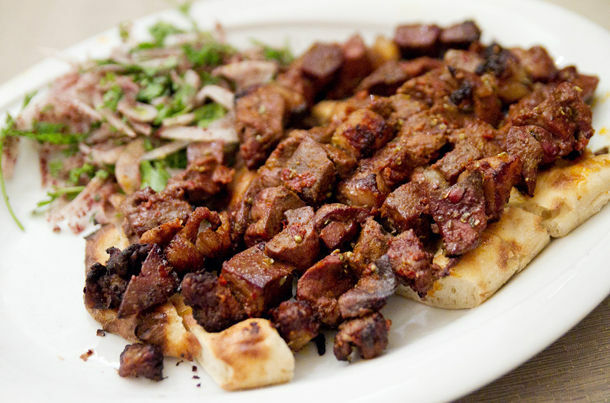 In addition, grilled liver is one of the most adorable dishes in Turkish cuisine that is also loved deeply by Turkish people. Canim Cigerim is located in Beyoglu, Asmalimescit. Do not get surprised when you see only 2 dishes in the menu which are grilled liver and shish kebab. However I bet you will fall in love with any of them. Which one you choose is never matters! Located opposite of the Suleymaniye Mosque, Erzincanli Ali Baba offers a perfect historical setting for eating the most popular dish of all times: Bean. You may ask yourself that how delicious bean can get but don't decide before eating. Seasoning with onions, tomato and chili pepper, they make the most delicious white bean ever, adding also their indescribable talent in it of course. 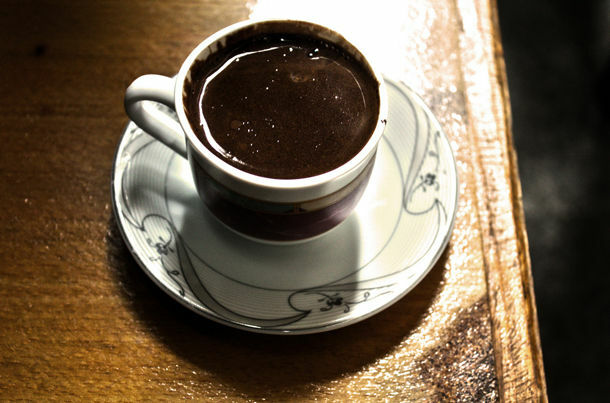 Although Ottomans are known to introduce coffee to Europe, it may be difficult to find that delicious Turkish coffee even in some popular places. Mandabatmaz, located in Istiklal Street, Beyoglu makes probably the thickest and the most delicious coffee in Istanbul. They still use the traditional copper coffeepots to make the coffee instead of electric coffee machines and use a specialized kind of coffee beans. 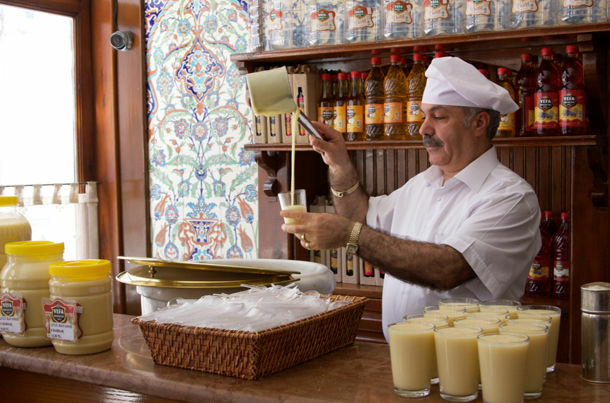 Boza, a traditional drink that is made of fermented millet, is highly popular especially in winter months in Istanbul. Vefa Bozacisi is located at the same place since 1876 and proudly preserves the glass from which Mustafa Kemal Ataturk, the founder of the Turkish Republic, drank Boza. You will be welcomed by the worn marble doorstep and feel the spirit of the history in this well preserved bar-like traditional shop. You may find strange this pudding-like, sourish drink at first but believe me, you will not forget this taste easily. Rice dish (aka pilaf) is very popular in Turkish cuisine when it is plain and it is the most preferable side dish accompanying the meat dishes. This pushcart in Unkapani, near IMC, offers you probably the best pilaf in town topped with chicken, chickpeas and black pepper. I must also say that this popular pushcart of the heavenly taste serves not only the passers-by but also the celebrities. Kaymak, a kind of clotted cream in Turkish cuisine, can be considered as the royal family of the breakfast together with the crusty bread and honey. 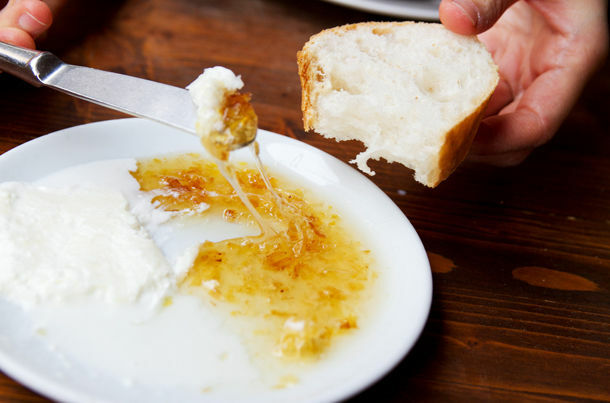 You take a slice of hot and crusty bread, spread the kaymak on it and crown with the honey. This is the one way ticket to heaven. If you are not sure where to get this ticket, I can willingly guide you. Since 1895, Besiktas Kaymakcisi has been serving at the same place giving you a plate of honey and kaymak only for a few liras. If you want to taste the most delicious dishes from traditional Turkish cuisine you need to give the restaurants where artisans eat their lunch a chance. Sahin Lokantasi is one of and probably the best of these restaurants in Istanbul. Any traditional Turkish food is at its best taste and you can have the chance to try different Turkish dishes on each day at surprisingly cheap prices. Located in Beyoglu, Orhan Adli Apaydin Street, Sahin Lokantasi is where you can let yourself go eyes wide shut. You definitely will not regret. 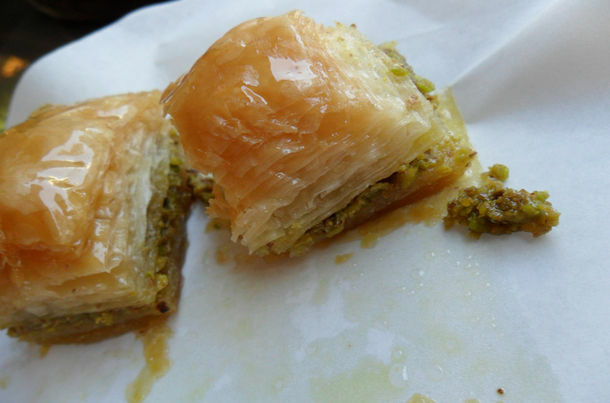 Having worldwide reputation, baklava is the king of all desserts in Turkish cuisine. I barely know a person who can resist this magical taste. If you are one of the people who cannot too, come and fall in love with this dessert of Gods once again in Koskeroglu. You may mostly encounter the name of Gulluoglu when you search for the best baklava in Istanbul and it may be true, but I'm doing you a great favor right now. Go and try it at Koskeroglu then you will definitely understand what I'm talking about. Try it with kaymak and a cup of Turkish coffee to balance the sweet taste of these delicious babies. Turkish breakfast is legendary as everybody knows and for Turkish people, it is the most important meal of the day. Even in the weekdays, they try hard not to to skip this meal and they take our times to eat a full breakfast. Mehmet Demir’s Breakfast Pushcart is always there to give a hand to the people who are in hurry yet need a full breakfast. Just drop by this pushcart and get a full sandwich of Turkish breakfast. What do you like for breakfast? Cheese? Olives? Tomato? Pepper? Honey? Kaymak? Eggs? Jambon? Or all of them? They are all ready, in a sandwich. Enjoy. Divided by a strait, Istanbul is a very lucky to have a great diversity of fishes and eating a fried fish sandwich on the bridge accompanied by a beer is probably the most popular fast food tradition in the city. With two different breath-taking views on two different sides of the bridge, you can have an unforgettable meal enjoying the stunning view the historic peninsula at a surprisingly cheap price.